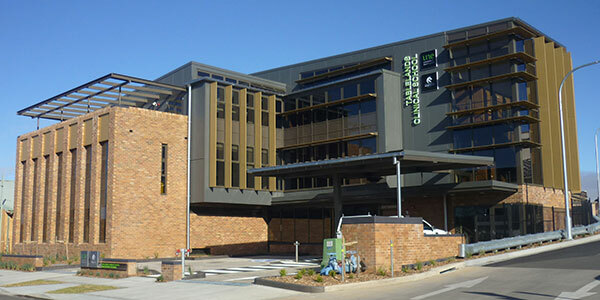 Hunter - based around the John Hunter/Royal Newcastle Centre, John Hunter Children's, Calvary Mater Newcastle and Belmont District. Maitland - based around Maitland Hospital. establishing close links to organisations associated with the delivery of undergraduate and postgraduate medical education to maximise the opportunity for shared learning and efficiency in the use of available health resources. the gathering together of resources from the JMP partners to maximize effectiveness and efficiency in the provision of clinical medical education. The Tablelands Clinical School covers the geographic area extending from Armidale to include Glenn Innes, Inverell, and Tenterfield. The students' Years 1 and 2 clinical skills will continue to include some in-hospital based teaching. Year 3 students undertake the bulk of their clinical training in geographically widespread general practice and some hospital training. Year 4 and Year 5 students require prolonged in-hospital attachments within one of the six JMP clinical schools. Students and clinician teachers require structured and well-organised education environments that facilitate teaching and learning. Traditionally these environments have been the wards and outpatient clinics of large metropolitan teaching hospitals and the rooms of private practitioners. In the rural and regional context, it is clear that the patients available to be seen by medical students in large teaching hospitals do not frequently provide the students with the breadth of clinical experience required to achieve the competencies in rural medicine. Within the JMP, the acquisition of clinical skills is a 'spiral process' from an early introduction to learning clinical skills and attitudes in Year 1 to the full year of 'pre-internship' clinical placements in Year 5. Within this Learning Spiral, clinical skills are acquired through time-limited clinical tutorials in Years 1 and 2, clinical attachments in Year 3 and full-time clinical placements in Years 4 and 5.